Great Alaskan Earthquake Survivor, the powerful story of a young teenage girl caught in the JC Penny building during the 1964 earthquake. An amazing story of survival. My name is Mary Jane Dougherty and this is my story. The story of how my brother Norman and I survived the 1964 Alaska earthquake. When the "Great Alaskan Earthquake" struck, my brother and I were in JC Penny's in downtown Anchorage. Moments later we were running for our lives as the JC Penny building was collapsing all around us during one of the strongest earthquakes ever recorded in North America. This is my story of survival. Yes, I'm an earthquake survivor, and this is my story of the amazing things I experienced and witnessed during that horrifying Good Friday earthquake. And it's yours free. "The ground was rolling like waves on the ocean and we were breathing in all that choking dust." Now you can experience the Great Alaskan Earthquake through the eyes of a survivor, because I've told my incredible story in this exciting book. Even writing this book was a traumatic experience, because what I saw and the terror I experienced on that day, still live on in my memory after all these years. Are you a survivor of the Good Friday, March 27th, 1964 earthquake? You will relate to, and appreciate what you'll experience when you read my story. You can download Mary's story of survival right now. This is an instant download that you can read on your laptop or portable device, at home or on the go. Once you start reading Mary's story, you'll find yourself caught up in the moment as you follow her and her brother through Anchorage's JC Penny building and outside where stones rain down as huge concrete slabs crash onto the sidewalk all around you. You'll experience the rolling earth, howling wind and choking dust that surrounded them as they desperately searched for a safe place. If you experienced the earthquake, or just want to know what it was like, Mary's book is a must read. 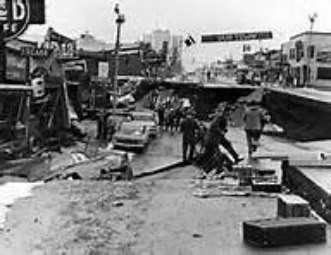 There have been many stories told about the 1964 earthquake, but this story, seen through the eyes of a teenage girl as she saw her world of Anchorage being torn apart, is an experience you won't forget.